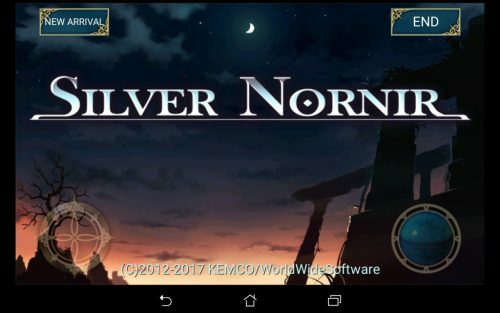 There is 1 review for 'Silver Nornir'. So maybe my review is a bit too much of “I love this game”. I didn’t liked very much the description on Google Play, but I absolutely LOVED the blog post by 1oldtymer. You must check it out, it’s far better than my humble review. Well, I love this game. Even music and the paid items (they’re useful and can be obtained with a special, intelligent grinding for IAP currency. Oh, you don’t need them by the way. Even the third magic crystal slot is free, and I’ll explain it now). Magic Crystals which allow you to freely distribute magic is cool, and there are various kinds of Magic Crystals. They not only grant magic, but they also affect the status – like a weird class system. But you don’t need to rely on magic, there’s skills and special attacks too. Well, there are even combos. It’s not a difficult game. It’s rather fun. The team is always a mess until the end-game. Even having the hero for the whole game is NOT warranted, but unlike various games, this is done properly. This is done in an actually *fun* way – I usually hate games which does this kind of stuff, but this one deserves the exception. Oh, and don’t worry with 10 players when only 5 can battle: everyone gets experience. There’s the guides, and it is a bit too verbose on story, but it’s ok because story is a strong point. This is also like an improvement of Fortuna Magus. The battle system is very similar, and there are the fight ratings, if you exploit enemies weakness, causes criticals and uses some features. To don’t get behind on art, during dialogs, the characters eyes blink. Just a minor detail, but it gives the feeling of the world in motion, which is important on this game. You can even rename chars, and battles are voiced – It’s a polished WWS game. This is an amazing game, so lets start at 5.0 and see where the game sins which is not a matter of personal taste. 1- Uhm, it’s not particularly difficult, and there’s not a difficulty setting. Oh, about the controls, I love the d-pad. It have a touch movement option but I never used it. As long that you like the battle system you’ll find the game very enjoyable. The battle system is a bit different from others. If you’re afraid of wasting money, my personal advise would be to download Fortuna Magus Trial first, do a battle, and if the battle system is OK, then you can buy this game. Of course, if you don’t like FM battle system, odds are, you’re going to hate this game.